open-front shelving so I could see my fabric. The shelves had to be short, because fabric doesn’t stack very high and any extra space would just be wasted. And finally, it had to be CUTE. I wasn’t going to spend $ on something that wasn’t cute. Then I found it (see photo). It was the right color, right height, right size and exactly the right level of cuteness. It was a splurge, but I will splurge for cuteness & perfection. When the shelves finally came, I opened the box and the first thing I noticed was how cute they were. The second thing I noticed was how smelly they were! But not to worry – I opened the windows and aired them out for a couple of days. Then when I thought it was safe, I started getting my fabric folded into perfect little piles to fit in those perfect little cubbies. That’s when it hit me. Not only did the smell seem stronger, I was getting a headache from it. I can’t sew with a headache. 😦 A little online research told me exactly what I needed to know – the MDF used in this furniture releases formaldehyde, polluting the air in my house not for a few days but continuing to release it for several years. I think the paint is also partially to blame. The sad thing is that this furniture is marketed for use by children. *sigh* Needless to say, I called, complained and got it all returned. It was around that time that we got a new handyman. He does it all, including building furniture from scratch (so jealous). So after going over the dimensions, paint color, and wood, he brought me the finished product: my early Christmas present. The only adaptation I made was cutting one set of shelves into 2 shorter shelves. These shelves hold WAY more fabric than the shelves I had before. And the old shelves took up more space. So happy with these. They cost $100 more than the ones I returned – definitely worth the cost of no headaches! Wishing I knew about cabinet makers before – am now a huge fan of custom furniture. This storage unit is divine! What a bonus to have a handyman that can create awesomeness! Your fabrics look so colorful and inviting in this unit. I’m sure you will love this piece for a long time. Wow, what a wonderful storage solution! Lucky you!! 1. envy. 2. envy. 3. hilarity, my fabric would not fit in those shelves 4. what’s in the cupboards? Go you for sending back the outgassing first lot! I’m glad you have such a nice piece of furniture. Hey AJ! 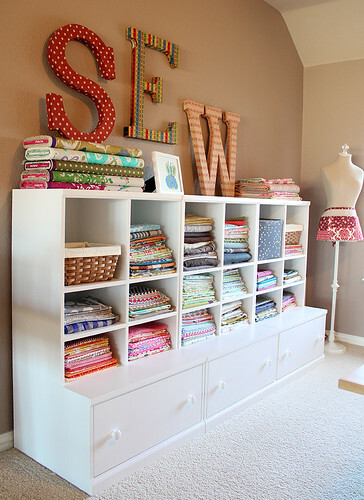 When my fabric filled the shelves, I was shocked. Needless to say I’m not buying any more until I use up some of this fabric! I love the drawers because it fits the non-glamorous stuff like batting and interfacing. Merry Christmas! This is lovely…might need to start looking for a cabinet maker too! What a great and beautiful solution!!! These are just some great ideas! Loving all of the examples, ideas, pictures! Makes the mind wander at all of the fantastic things you can create! Love the shelves! And the big letters too! Thanks! I made those SEW letters a few years ago and they’ve been in storage for a while. So glad I now have a place to put them! What a great piece of furniture…….I am all for custom anything because it helps the local economy…….enjoy your wonderful piece! Please be careful storing your fabric this way. The natural light bleaches it, I found out the hard way opening up a piece of fabric and finding half had been bleached and it was ruined. I keep mine now in plastic storage boxes in a dedicated room for fabric. It may be worth investing in some plastic boxes small enough the fit on your unit? Very pretty cupboard and shelf. You don’t even have to sew. Just sit in a chair with a cup of tea and stare at it. Deep sigh of contentment. By the way, have you seen the furniture site by Anna White? She has tons of very clear, free plans for furniture. We made a fort-bed that turned out great. Would you share the dimensions? Love your shelving, I could think of some uses for them in my daycare and sewing and scrap room. Great info on the stink stuff on your fabric storage. I now will also find me a aged cabinet man to make my fabric storage. Your fabric stash appeals to me in so many ways… I love the look and can “feel” the fabric texture and respond to all of the color and pattern. I did something similar to this in the past and discovered a problem. Even though it was in the darkest corner of the room, the fabric faded on the deposed folded edge! Please be careful as I know that your fabric is precious to you. What are the dimensions? I will make my husband get to work on it. I want 2. One for my little girl’s nursery and one for my sewing/craft room. What a handy set up!!! Your handyman could probably make a fortune selling the pattern for this unit!! I know I would buy it!! Would luv the dimensions also . Great piece of furniture. I know of a great furniture maker . I would greatly appreciate it. That is so perfect! It is exactly what I need. Would you be willing to share the dimensions? My husband can build one for me. It is fantastic! I have shelving envy! ❤️ You are fortunate to have found a true craftsman, he’s obviously not just a handyman. Do you think he’ll share the plan…hmmm? Enjoy! Dimensions can be found at the link above. Mine is a bit taller with one extra row of shelves. Hope this helps! Whoa. It was in 2007! Hope you get to make some for yourself! It was a fun project! I really like this arrangement. It is crucial for me to see what I have or I’ll forget what I’ve bought and buy more – a total waste of money no matter how much I love fabric! I like the drawers, too. Did you know that a CD storage tower will hold 300 fat quarters? Mine is knock together, but I did not have the issue you did because it is wood. I am so glad to know that. Happy sewing! Yes, Dianne, I also have to be able to see everything otherwise I don’t remember that it’s there! It’s been a few years since I got these shelves. They still work perfectly! Thanks for stopping by the blog! Where did you get these at or made? I had mine built by my local handyman. Mine is basically 3 drawers with 3 cubbies. But my shelves are taller with one extra shelf on each section. Also, my shelves and drawers are attached for a total of 3 pieces rather than 6. Hope this helps! this is just the sort of unit I’m looking for , where can I buy it from ?? But I had mine made by a local cabinet maker because the ones I purchased off-gassed too much and gave me a headache. Dimensions can be found in the listing. I hope this helps! Due you mind giving out the dimensions?